As your family dentist in Salmon Creek, our team understands when most patients hear the word hormones they think of those awkward teenage years that should make the public display of old high school yearbooks a crime. (Punishable by a forced feathered haircut or perm, perhaps.) However, hormonal changes can also impact the oral health of both men and women. While most patients know that during middle age, the fluctuation in female hormones such as estrogen can cause a number of problems before, around, and during menopause. It’s been well established that women can become more susceptible to bone problems such as osteoporosis, join pain and heart conditions. Temporomandibular joint pain – commonly referred to as TMJ – can develop due to a decrease in estrogen levels, as estrogen provides an anti-inflammatory effect on the body. However, a decrease in estrogen can also cause a variety of oral health problems as well. When estrogen levels drop, it can impact the amount of water the body maintains as estrogen plays a role in controlling the regulation of fluids in the body, including the fluid content of the mouth. A change in hormones doesn’t just impact women’s either. Lower testosterone levels in men can also result in increased dry mouth. Combine the impact hormone fluxuation has on the body’s ability to regulate fluids with the fact that the body ability to conserve water drops with age, means that it’s far easier to become dehydrated the older we get. Fortunately, you can take steps to lower your risk of dry mouth and dehydration by drinking plenty of water and increasing the number of foods in your diet that have a high water content, such as fresh fruits and vegetables. To ensure you drink enough water a day, try to drink a full glass of water during each meal. Not only will this habit help to keep you hydrated, it will also help to wash any food debris away that might linger in your mouth after eating. If you experience dry mouth during the day, try chewing on sugar-free gum to keep your mouth moist. Chewing gum will cause your mouth to naturally salivate and help to offset any dry mouth you may be experiencing. If dry mouth becomes a persistent problem, talk with Dr. Nelson to determine what might be the cause of your condition. As estrogen levels continue to drop in the years following menopause, women become more likely to develop severe gum disease. Low levels of estrogen cause inflammatory changes in the body that can lead to the development of gingivitis, an early stage of gum disease and precursor for the more serious periodontitis. Most postmenopausal women – 60 percent – will suffer from periodontal problems. The best way to lower your risk of gum disease whether caused by hormonal change or poor oral health is to maintain a quality oral hygiene regimen. Cleaning between your teeth and along the gum line is vitally important because your gum tissue is the foundation of your teeth, and a weak foundation can lead to permanent tooth loss. 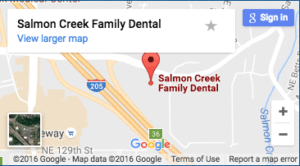 If you have any questions about how a change in hormones can impact your oral health, make sure to ask your family dentist in Salmon Creek, Dr. Dale Nelson, during your next visit to Salmon Creek Family Dental.